THE SANDCASTLE GIRLS, Chris Bohjalian’s 15th novel, covers a different territory from most of his other books, which usually feature his home state of Vermont. This moving multi-generational saga of an Armenian family is set on multiple continents and encompasses a century of tumultuous change and upheaval both in the world at large and in the lives of its protagonists. 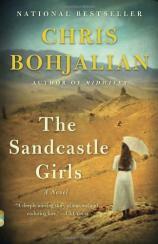 Like Bohjalian’s previous works, THE SANDCASTLE GIRLS features ordinary, relatable characters caught up in events beyond their control. "This is a sober, elegiac and touching novel that does not flinch away from depicting the depths of human suffering, but is also able to illuminate the human capacity for survival and resurgence." Laura Petrosian, an obvious stand-in for the author himself, is a successful fortysomething American novelist in search of her roots, in particular those of her ancestors who fled the Ottoman Empire during the Armenian Genocide at the hands of the Turks. The Armenians know this event as “Meds Yeghern,” the Great Catastrophe. Laura’s search is prompted by the discovery of a photograph of an emaciated woman in an exhibit of Armenian victims of the ethnic cleansing. She bears Laura’s family name, so perhaps she is a relative of some sort. Laura, who has basically tolerated but has not embraced her grandfather’s ethnic heritage thus far, is suddenly inspired to learn more about the events that shaped her Armenian ancestors’ lives. The novel travels back and forth in time between Laura’s current-day search for her family’s history and her American grandmother Elizabeth’s introduction to Armenia nearly a century ago. Twenty-one-year-old Elizabeth Endicott lands in Aleppo in what would become modern-day Syria in 1915 as World War I rages around the globe. She is freshly armed with a degree from Mt. Holyoke, a spattering of nursing know-how and a few words of Armenian and Turkish, and a naive optimism that she can do some good on behalf of the Boston-based organization, Friends of Armenia. Elizabeth and her wealthy banker father Silas are on a mission of mercy to aid Armenian Genocide victims, but neither of the Endicotts is fully prepared for the horrors they are about to witness: all the Armenian men have been killed by the Turks, and only emaciated women and children remain, to be force-marched to “refugee camps” in the sweltering Syrian desert where they are slowly and deliberately starved to death. Through the Endicotts, the reader is introduced to the full scope of the holocaust that butchered 1.5 million Armenian Christians --- three out of every four Armenians living at the time. This is an event in history that, although quite as brutal and horrific as the Jewish holocaust, has shockingly been mostly forgotten outside of the Armenian diaspora by now. Soon after Elizabeth’s arrival in Aleppo, she meets an enigmatic engineer by the name of Armen Petrosian. Elizabeth’s time with Armen turns out to be fleeting as he soon escapes Aleppo to join the British Army’s motley crew of Australian and Indian soldiers in the fight against the Turks. However, Armen finds himself compelled to write a series of letters to Elizabeth, who learns that he is fighting the Turks to avenge the deaths of his wife and baby daughter who were murdered in the ethnic cleansing. As the war engulfs the continent, Armen and Elizabeth come to realize their love for each other and are happily reunited. However, even as Elizabeth prepares for her future with Armen, she discovers a tragic secret that she must take to the grave with her. Although the two lovers are able to create a new and comfortable life together in America, their marriage remains tinged with “sadness, secrets, and wistfulness” as seen through the eyes of their granddaughter Laura. Now Laura finally learns the family secret that has haunted her grandparents their entire lives. Although THE SANDCASTLE GIRLS is centered on a romance, it is also a history lesson, and a riveting one at that. Bohjalian narrates a personal and moving story about an important historical event that people have largely forgotten. This is a sober, elegiac and touching novel that does not flinch away from depicting the depths of human suffering, but is also able to illuminate the human capacity for survival and resurgence.